Approach over the location—The site area is approachable by railways and roadways from the rest of the country. Munger railway station is connected by Jamalpur Junction on Kiul –Sahebganj loop line of the Eastern railway NH 31 from Patna ,then joining NH 28 at Mokama-Hashdiah leads to Munger on junction of NH 80 via Lakhisarai. Lodging—Middle class hotels ,rest houses inspection bunglows Dharam salas and railway retiring rooms are available for stay. FOOD-Rice-pulse,sabjee,bhujia, chapatti(bread) etc –along with non veg preparations of fish-mutton,chicken,egg etc are available as common meal in the market.Kachauri ,jalebi and singharas are common breakfast' snacks. DRINK-Sweet water is availale for drinking purposes along with other soft and hard drinks. Local transport-All types of local transport are available.Such as cycle rickshaw,auto rickshaws,tam tams jeeps and mini bushes. 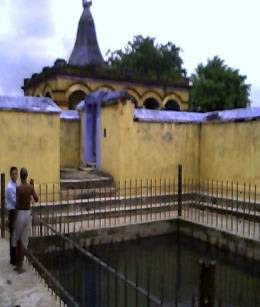 About the site –The site is a pious place for Hindu devotees of mother Parwati.It is situated in Munger township itself. After getting at Munger railway station or Bus stand one can walk down to the site in half an hour or take cycle rickshaw or auto rickshaw and reach the site. It is an eye ball of gold and silver studded in a statue head representing mother Parwati. Mythology goes that one eye ball of mother Sati dropped here out of destroyed and burnt dead body of Sati in hawan kund of Yaksh which was being taken by Shiva in the sky on his shoulder. This got that place empowered for that portion. This way one who worships at this place is cured from eye troubles,besides other blessings of physical and menial enrichment. 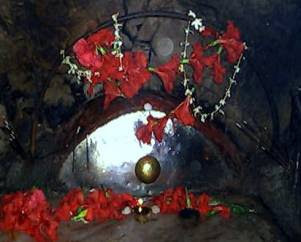 The original worshipping place is a cave.A large inverted karah(cauldron) shaped stone structure has developed here. According to local say there was a king named Karan(whether of Mahabharat is still debatable) who was devotee of mother Chandi. He used to sacrifice himself by plunging in hot boiling oil in the karah. Mother Chand pleased by his devotional sacrifice used to make him alive as well as give him gold worth his weight. the sense that although it is hot spring but it becomes cold on full moon day . Remarks—Attached with other heritage the site has good prospect of further development Medical facility of moderate standard is available at Munger.